Free Christian lyrics and Bible verses presentation software, accelerated! Displays lyrics with or without chords, Bible verses, images, videos (wmv) and presentations, using a computer and a video projector. 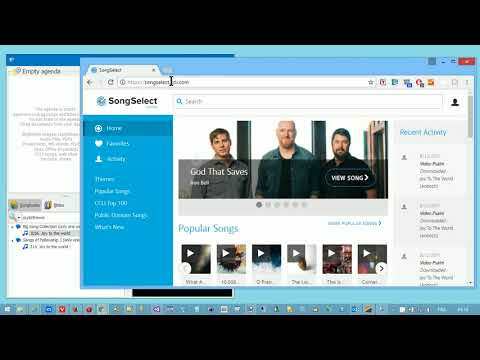 Import from many other formats like OpenSong, EasyWorship, VerseView, etc. Gives access to 300+ Bibles and 10.000+ songs in several languages. VideoPsalm was added by RobertL87 in Jun 2013 and the latest update was made in Sep 2017. The list of alternatives was updated Nov 2018 There is a history of all activites on VideoPsalm in our Activity Log. It's possible to update the information on VideoPsalm or report it as discontinued, duplicated or spam. This software application creates PowerPoint presentations from Bible texts. Alternatives to VideoPsalm for Windows, Mac, Linux, Web, Android and more. Filter by license to discover only free or Open Source alternatives. This list contains a total of 25+ apps similar to VideoPsalm. This is a link to a review by VotivePraise titled “Meet the Best Free Worship Presentation Software”. It is a simple but well complete program, it provides the basic needs of a presentation.